A fan controller is an interesting piece of optional equipment. 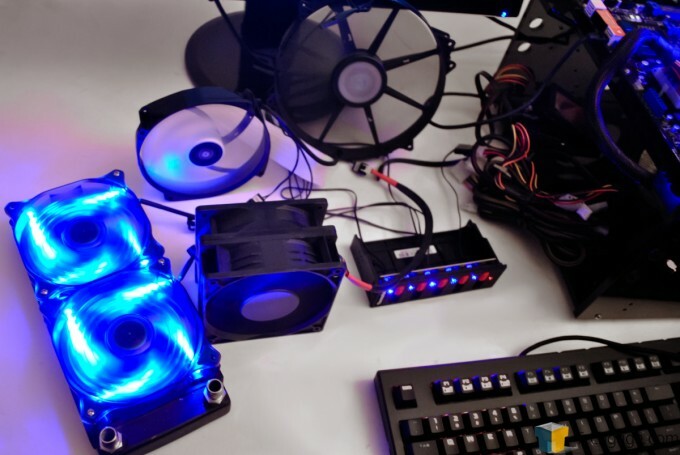 Strictly speaking, most people don’t really need one, but some prefer to have full control over their fans and also the possibility of eking a bit more performance out of them. Thermaltake’s Commander F5 aims to deliver on both fronts here, and hopes its good looks will win you over. Fan controllers are a lot like, I don’t know, adjustable suspension systems on a road car. Even on a car with sporting pretensions, the fact is that unless you intend to take it to your local race track and indulge in regular cycles of hot lapping, you would never experience the benefits of changing the spring rates, anti-roll bar stiffness levels, bump and rebound damper settings, and camber angles. But fan controllers on a computer are not as pretentious as fully adjustable suspensions are on anything less than a racing car. For example, let’s say you live in an area where your ambient temperatures tend to soar, especially in the summer, and then dip down low during the winter. I used to live in an apartment that was so poorly insulated and didn’t have air conditioning where summertime temperatures reached 110°F/43.33°C, and then plunged to around ~60°F/15.56°C during the winter. To combat these ridiculously high summertime temperatures, I equipped my PC with dual 120mm x 38mm 3700RPM Delta fans for its CPU cooler just to keep my overclocked dual-core Opteron 170’s temperatures in check. This PC also had high-RPM 120mm x 25mm intake and exhaust fans mounted on my TJ09 case. Needless to say, this was a loud PC. But the noise was a necessary evil if I wanted to preserve my machine. Once the dreaded summer heat was over, though, the noise became unacceptable. Consequently, I had the option of either swapping out all my fans for slower-running units, or somehow slowing down my fans. Software-based solutions (including the BIOS) back then were just not as good and capable as they may be today, so I had to come up with a different solution. Thermaltake’s Commander F5 is a super-practical accessory for users with a need to manually control their systems’ fan speeds. It is designed to fit in a 5.25″ optical drive bay, where it should be easily accessible to the end-user. 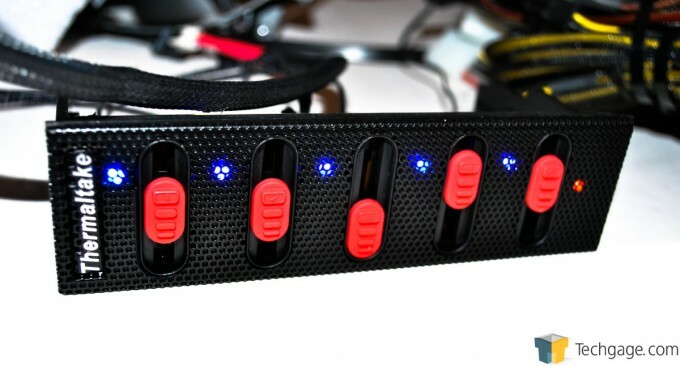 The Commander F5 is visually a very simple affair: Five vertical sliders in red, five blue LEDs to indicate active fan channels, a single red LED to show that the Commander F5 is powered up, and a discrete Thermaltake script on the left edge of the mesh panel. 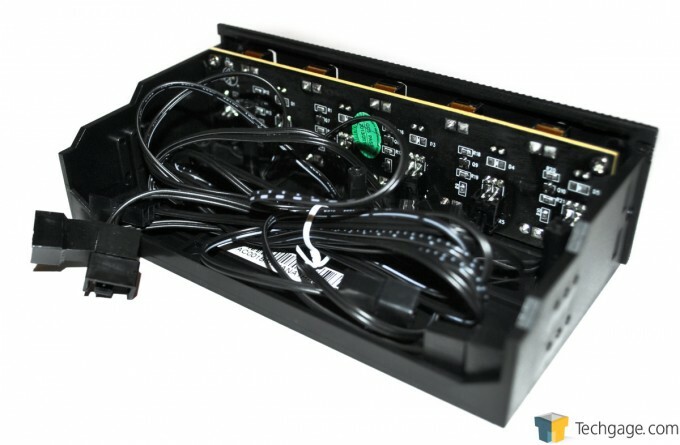 This should ensure that it will look at home installed in any 5.25″ optical drive bay, no matter what chassis it’s in. 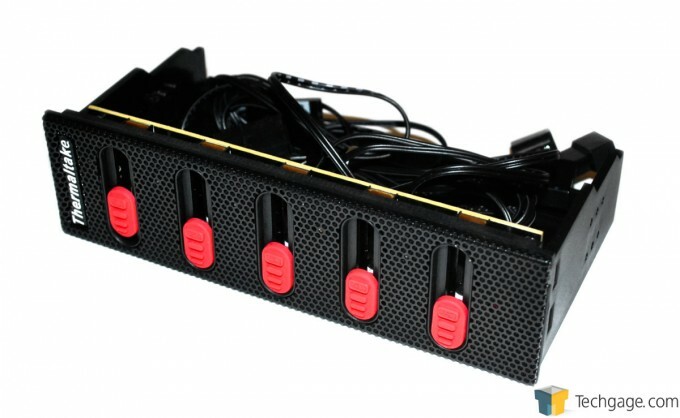 And by the way, Thermaltake includes a baggie with four bay installation screws. The view behind the mesh panel is a good bit busier, dominated as it is by the black PCB and a bundle of cables. The six cables run off the PCB. The left-most cable is the Molex 4-pin power cable which supplies power to the fan channels controlled by the Commander F5. The other five cables, then, are the five fan channels. 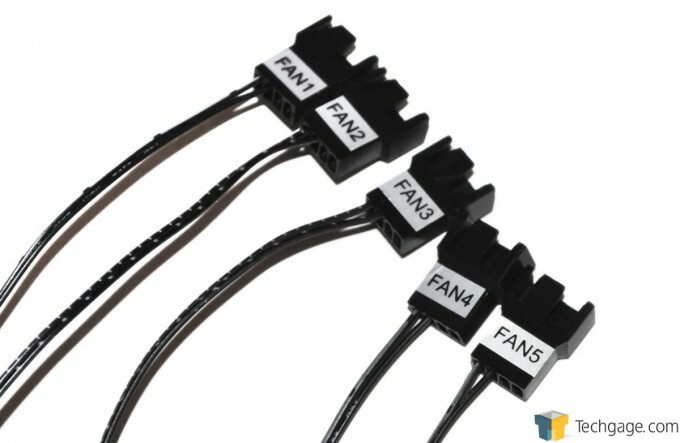 These all support fans with either 3-pin or 4-pin connectors. Let’s see the Commander F5 in action. Pardon the mess, but my dinner table is barely big enough to hold all the gear I’ve piled onto it. I’ve got the Commander F5 plugged into a Molex connector from the PSU that powers my dedicated Techgage test bench PC. And plugged into the Commander F5 are five fans: Two Cougar 120mm LED fans (mounted on a XSPC RS240 radiator, just as a prop right now), a 120mm x 38mm Delta tri-blade EFB1212SHE capable of 3700RPM (modified with the surround of a gutted 120mm x 38mm fan functioning as a shroud – I used to perform all sorts of cooling experiments with these things years ago), a 140mm x 25mm fan from my NZXT Havik, and one of Cooler Master’s 200mm case fans. The Commander F5 handled all five fans without any problems. Pulling the sliders down to zero position did not stop the fans completely; clearly, 4V are enough to keep every fan, even the monstrous Delta EFB1212SHE tri-blade, spinning. And with the sliders turned all the way to the top, every fan is fed around 10.5V. I wish I had a tachometer to measure each fan’s RPMs, but the effect on the Delta tri-blade was dramatic: Lots of RPMs, lots of CFM, and lots of dBA as well. So how do we finish up this quick look at the Commander F5? For sure, I think the F5 is worthwhile if you need to keep fan speeds under precise control. 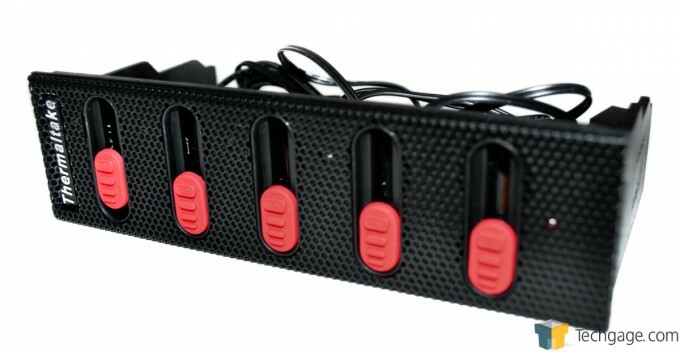 In my opinion, manual fan controllers make the most sense for users who run super-fast (and therefore super-noisy) fan set-ups, primarily to combat super-high ambient temperatures during the summer: Instead of swapping out fans when the weather changes, you can just dial your fans’ capabilities according to your current needs. Cosmetically, it’s simple yet aggressive. Black and red is a tried-and-true color combination, and the mesh front panel should work in most applications, especially if you have a case with an all-mesh front facia. The vertical sliders are also a handy visual cue as to just how much power you’re feeding your fans with. If you want to take full command of up to five fan channels, the Commander F5 might just be the perfect fan controller for you.